Don't miss this chance to see local talent at its finest. After his multiple sell out performances on stage over the past few years. Leon is live in London for a family friendly spectacular in a very special theatre with limited seats! 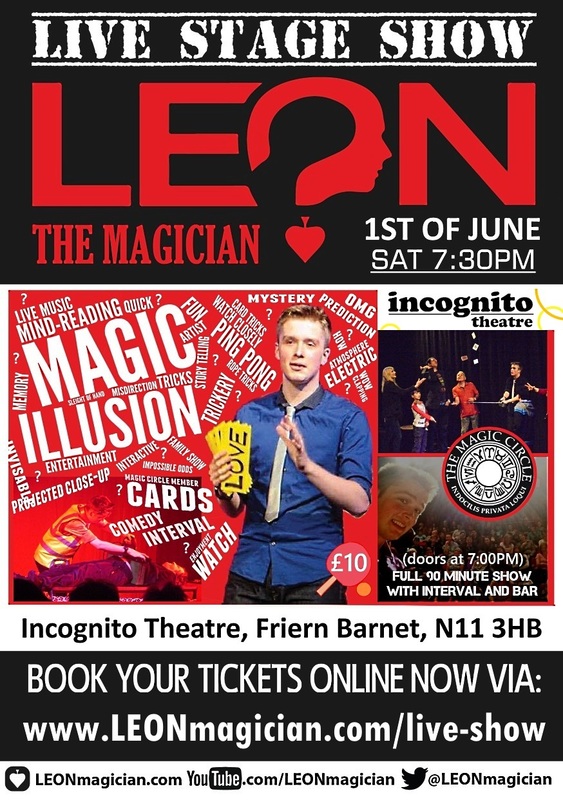 Leon Thomson is an enthusiastic, fast paced, exciting young performer with an outstanding talent for magic, illusion and tricks of the mind. A member of The Magic Circle, Leon recently made the Rock of Gibraltar disappear on live TV, as well as regularly performing in London as a professional magician. Table tennis has always been known to pop up in his shows too, as this is one of his other passions! This is a full 90 minute show on stage with an interval. There will be a bar and the show will have an interval. Each ticket will ensure a seat. Ticket is needed for entry. Friern Barnet, London N11 3HB.